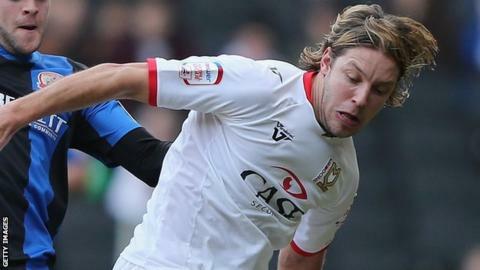 MK Dons striker Alan Smith has received a four-match ban after his club decided not to appeal against his sending off in the FA Cup defeat by Barnsley. The 32-year-old former England international was dismissed late on in Saturday's game for leading with his arm in a challenge on Rory Delap. Smith's suspension was increased from three to four games because it was his second red card of the season. MK have had seven dismissals this term - joint highest in the Football League. Only Notts County have equalled that number across all competitions. Dons boss Karl Robinson said after the Barnsley game that referee Mike Jones had made a mistake and suggested he would appeal against the decision. "I didn't even know it was a foul, but you see Alan Smith going to try and compete and right away ultimately the referee thinks 'that's Alan Smith, he has tried to do him, sending off'," he said on Saturday. "You could see it and, by the way, how quick did he go for his card? It looked like he couldn't wait to do it. "But if he sticks to his report he will know he has made a big error. It was a very split game, they were the better team in the first half and we were better in the second half." However, in a statement, MK said unsuccessful attempts earlier this season to have red cards shown to Stephen Gleeson and Antony Kay overturned had convinced Robinson to not lodge an appeal and risk the possibility of the Football Association further increasing the length of the ban.